To make this wonderful hairstyle first split your hair in half as shown. Then make two ponytails the first one being closer to the ear and the second one a bit towards the center and below the above one. The upper ponytail should be thicker than the lower one. Then start working on the upper ponytail and split it in four equal pieces of hair. Make rolls of all the four parts and secure with bobby pins. Do the same with the lower ponytail but this time divide it in only two parts. 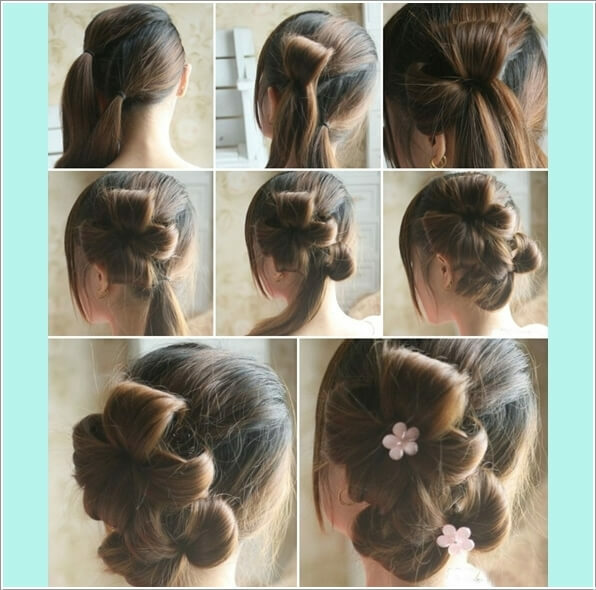 Once you are done the upper ponytail will look like a flower and the lower like a bow. Spice it up further with flower hair pins and voila!